After much internal back and forth, the Treasury Department and the top White House regulatory chief reached a memorandum of understanding Wednesday night that will allow the Office of Management and Budget to review proposed new tax rules from the Internal Revenue Service. Since 1983, the tax specialists at the IRS have been free to promulgate rules independently under a Reagan administration agreement drafted soon after rulemaking review was first centralized at the White House Office of Information and Regulatory Affairs. The IRS did not respond to a Government Executive query about the new memorandum of understanding on centralized rule review. 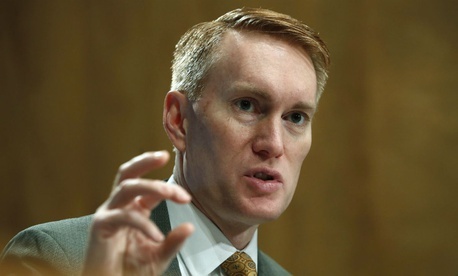 “We anticipate OIRA to be forward-leaning,” said hearing chairman Sen. James Lankford, R-Okla., warning that if the IRS is rushing a rule, the new MOU will allow OIRA to ensure that it does not rely unduly on guidance not backed by statutes, and that small businesses have ample opportunity “for a seat at the table.” By asking, “Is there a better way to do it?” OIRA, working with affected businesses, can “lean in” before the rule goes out and faces “a court challenge that will cost millions of taxpayer dollars and turmoil in the economy,” Lankford said. He cited several instances in which the IRS “got it wrong” and proposed rules had to be recalled, as well as small business complaints that some Obama administration rules were done without proper economic analysis. Treasury Secretary Steven Mnuchin has identified 300 rules to be eliminated or simplified, among them the “extremely complex” Volcker rule, a part of the 2010 Dodd-Frank Financial Reform Act that curbs banks’ ability to invest, as well as provisions of the new tax law such as those affecting pass-through business income and repatriation of overseas capital. “I don’t believe it will lead to undue delays, and OIRA will work with us to expedite” the process, McIntosh added. Heitkamp pronounced herself “very disappointed” in the administration’s effort to repeal an Obama rule protecting restaurant staffers’ tips from control by owners, noting that Rao was “caught in the middle” and forced to speak for the Labor Department, which declined to send a witness. News reports in February said that Labor Secretary Alexander Acosta and possibly Rao had overruled career agency economists and issued a proposed rule without a cost-benefit analysis, saying the data were not high quality. “That attitude was fairly cavalier,” Heitkamp said, calling the process used to roll back the existing rule “backhanded, ham-handed, irresponsible rulemaking.” She said she was “deeply concerned” that the same robust standards for evidence were not being applied when the agenda is deregulatory, and complained that the Trump administration had dismissed the news reports of a quashed internal study as “fake news” and false reporting. “I’m assuming it will be done professionally,” she added. “We will be watching, we need to lay down a marker,” given the high level of mistrust in the country. Sen. Maggie Hassan, D-N.H., echoed those views, noting that Congress in the omnibus spending bill signed into law in March “fortunately” had put into statute the main protections of the restaurant tipping rule. “The public deserves information on the proposed rule, which in general includes quantitative analysis,” she said. “We’re talking about money in the pockets of workers. That was a real mistake and showed a real disregard for quantitative analysis,” which was overruled by “political considerations,” she said. Rao responded she was working with EPA, but said “it is important that the public have information on the evidence used.” She declined to go into detail on her role in the handling of the restaurant tipping rule, but said best practices require getting as much quantitative analysis to the public as possible. She stressed her commitment to transparency, saying OIRA is one of the most transparent in the executive branch. “I can’t speak to the process” in the Labor case, she said, but Acosta “believed that data available was not sufficient” and to release it would be “misleading.” The plan, she said, is to release it with the final rule. That, the Senate Democrats pointed out, would mean the public would not have any opportunity to comment.